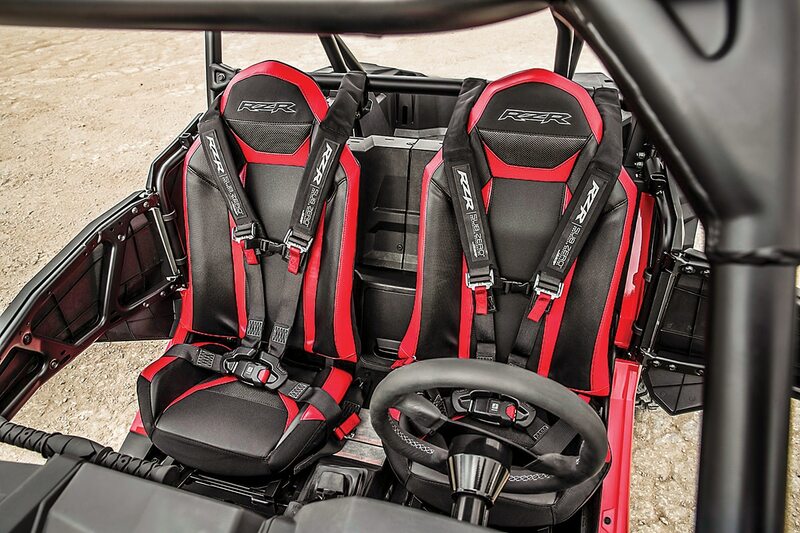 At a glance, the RZR Turbo S four-seat looks like the other four-seat RZRs in the lineup; however, park the new model next to a current XP 4 and you will see a huge difference. It’s taller, wider and will handle wide-open trails way better. 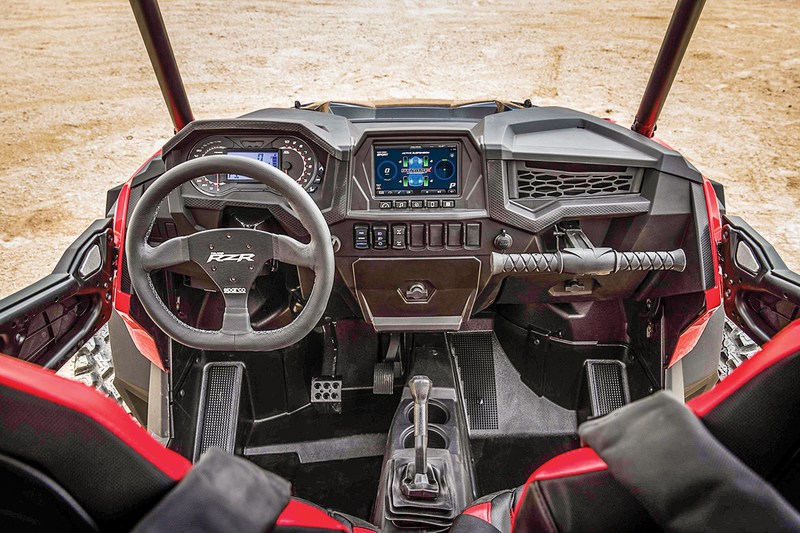 Look a little closer at the chassis and you will see a much beefier frame and robust suspension components that will advance the RZR’s reliability over some of its closest competition. Ground clearance is incredible in this RZR. It’s nearly double the amount of Can-Am’s X3 in the real world. The X3 has more wheel travel, but the RZR’s shocks are tuned much better. At $30,499, the four-seat Turbo S is the most expensive UTV you can buy in stock trim. It’s only $500 more than Can-Am’s Maverick Max X3 X RS. The new dash is a welcomed addition to this model. Dual glove boxes are hand,y as is the small cubby in front of the passenger grab-handle. HOW FAST IS THE ENGINE? In stock trim, the RZR XP 4 Turbo S will hit 80 mph with no trouble. It gets there in a hurry and can do it over bumps too. Even in choppy terrain, the shocks keep the tires on the ground and pulling forward. The ITP Coyotes have more traction than any tire we have driven on a production machine. Polaris claims these eight-ply tires are nearly 250-percent stronger than the Big Horn 2.0s that come on standard RZRs. We agree and always change out to eight-ply tires. ITP has some of the best. Four-point harness are standard equipment on both Turbo S models. They are a nice touch, as is the Sparco steering wheel. 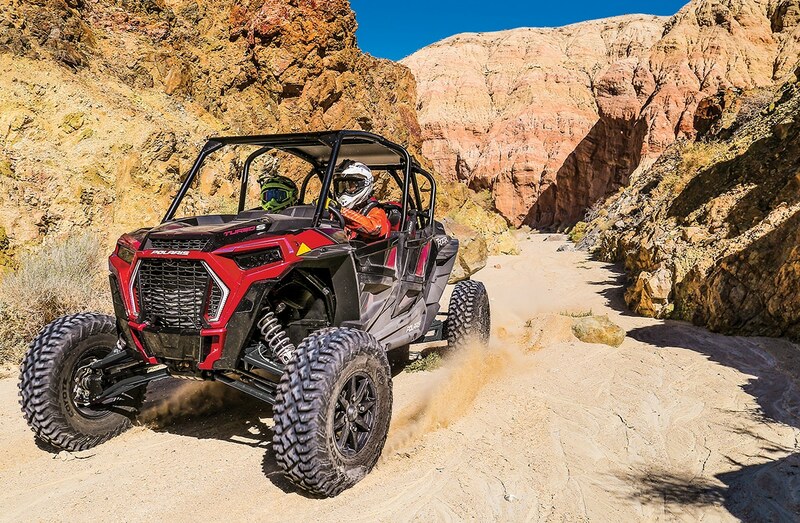 When Polaris introduced the two-seat version of this car, we were impressed with how well the clutch was tuned for the added weight and leverage of the longer suspension arms and axles. Polaris nailed it again with this ride. Power is instant and eye-wateringly fast. The drivelines have been beefed up, as well as the A-arms, and this model has 20-percent-better CVT belt cooling than the standard XP Turbo. Polaris tweaked the clutching and engine tuning to get the same Turbo powerplant to work as well in the wider S model. It’s tuned perfect and fast. Great. The 117-inch wheelbase is nearly perfect for a vehicle with this weight and width. Matched with the 32-inch tires, it rolls over big bumps and across ditches better than any other UTV. It has 16 inches of ground clearance, too, so clearing trail obstacles like rocks and logs is no longer cringe-inducing. Fox’s Dynamix shocks are amazing in this car. They absorb the hits 50 percent better than they do in the narrow car. The extra wheelbase of the four-seater helps it skip over deep bumps. WHAT ABOUT THE SUSPENSION & SHOCKS? 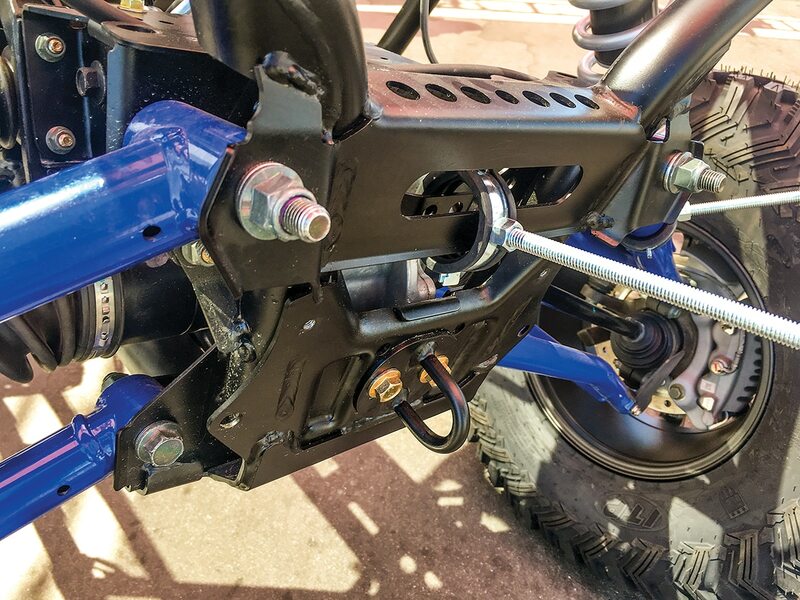 This model uses nearly identical-length Fox Dynamix shocks with electronically controlled compression adjusters. 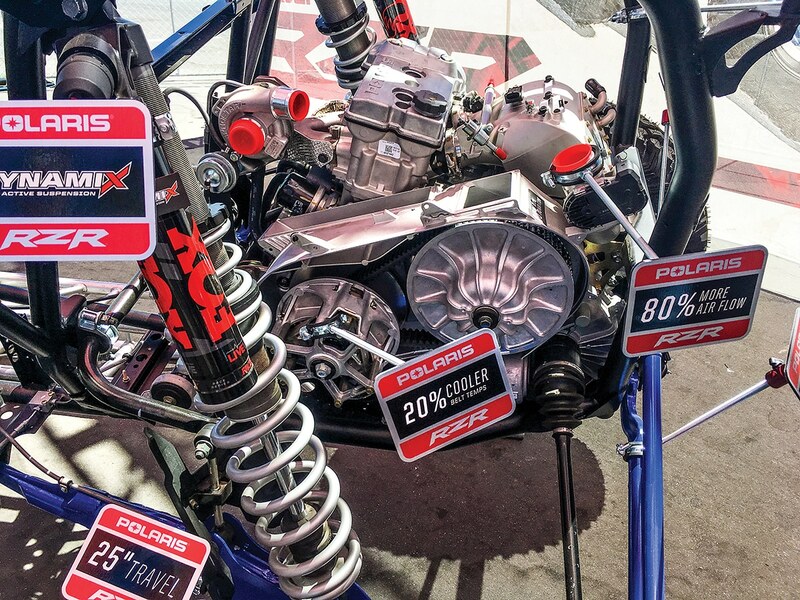 Polaris states that there are 25 inches of usable wheel travel when you consider tire flex. The actual wheel travel number is closer to 20 inches front and rear; however, that is as close to the magic number as you can get with a car this long. Even big off-road race cars tend to run about 20 inches of travel. The shocks are excellent, and with a longer wheelbase we like them even better on the four-seater. The three-position compression settings are far enough apart that you can feel the difference at the seat of the pants. When you hammer the bumps, the shocks soak up hard hits and do not kick on rebound. 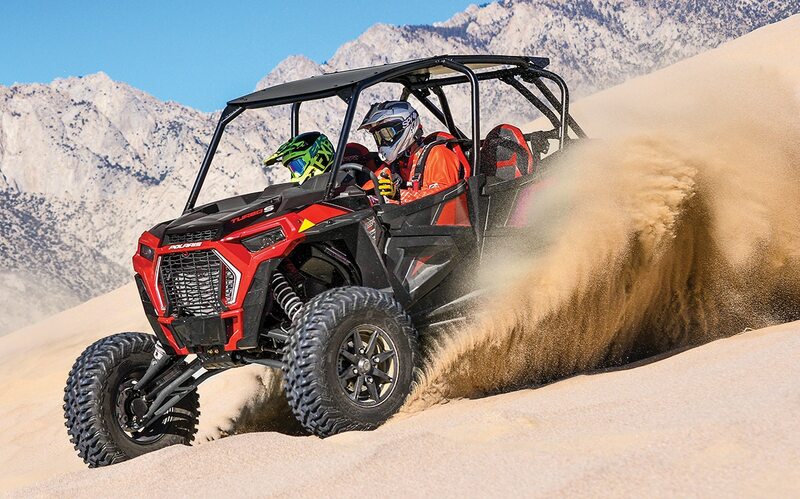 Compared to the X3 Max, we love the ground clearance advantage this RZR has. 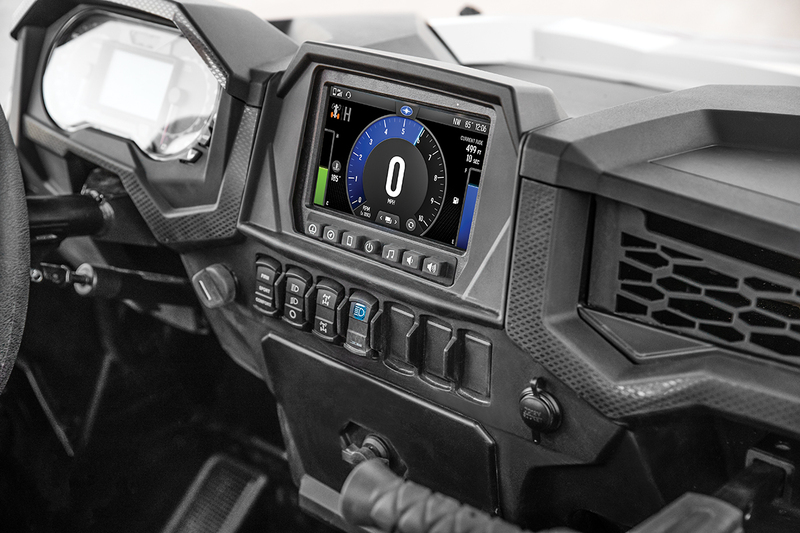 The RZR XP 4 Turbo S gets a new Ride Command info center that is easier to read in bright daylight. Polaris is constantly improving its Ride Command trail database and functions. 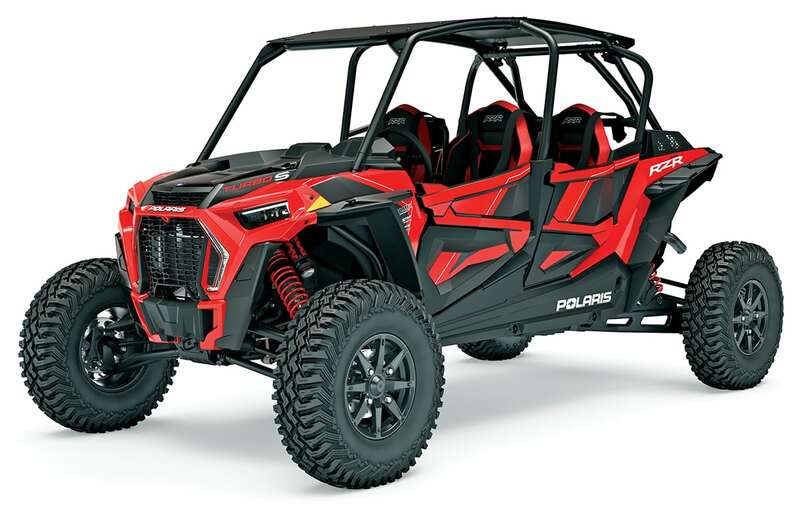 Polaris actually increased the braking force from the two-seat model to this one. Both machines now get larger rotors and the three-piston calipers in the front. They do a great job slowing the 1-ton machine from any speed. During our testing, we did notice a spongy pedal a few times, but after bleeding the brakes that should go away. 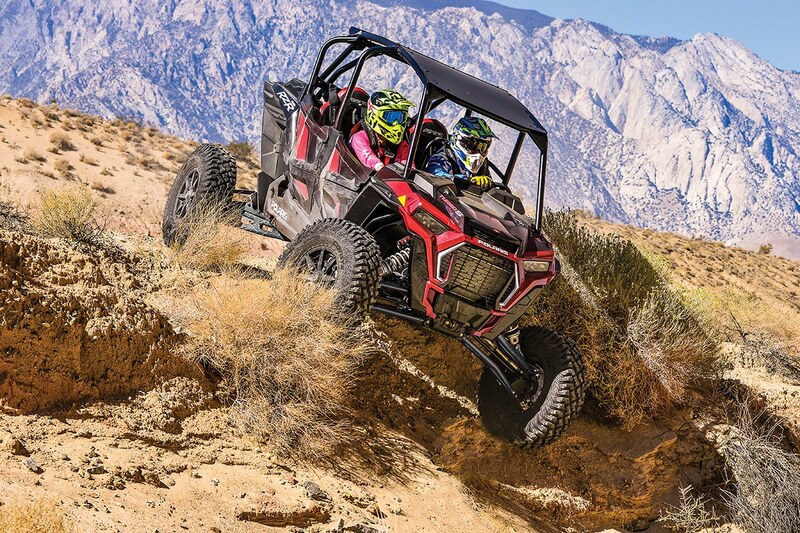 From the three-piston front brakes to the beefier A-arms and frame mounting points, this RZR is the strongest one yet. It’s good. It’s plusher than the two-seater thanks to the longer wheelbase. The back passengers have nothing to complain about, either. There’s just as much if not more room as with a standard four-seater. The supplied four-point harness will keep everyone safe, and the full doors will keep everyone a bit dryer and cleaner. If you have the room to stretch its legs and the coin in your pocket, you can’t go wrong. With all the improvements Polaris made to the chassis, it’s great right out of the box. The chassis, motor and suspension are strong. At the very most, you might want to customize it with a set of tires or maybe a different cage for your terrain and style. Claimed dry weight 1989 lb.